Hot stamp or direct heat imprinters are available as free standing table top units. They are quick and easy use and will print on poly bags, aluminum foil, paper and all varieties of plastic film. 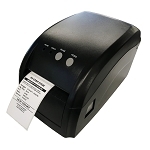 They clearly print manufacturing or expiration dates, SKU numbers, lot numbers, company name, weight, price, product name, country of origin, etc.